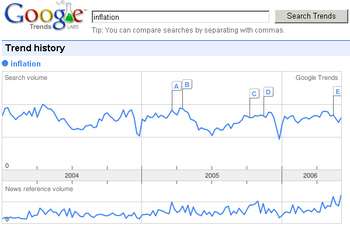 Google Searchers Worried About Stagflation? Recently, from our website traffic counter, we've noticed that a lot of people have been doing Google searches on 'stagflation' and ending up on a recent post we did on the subject. Wondering whether this was a coincidence or the beginning of a bigger trend, we put this to the test using Google Trends and found that there indeed has been a pickup in the search for the term. 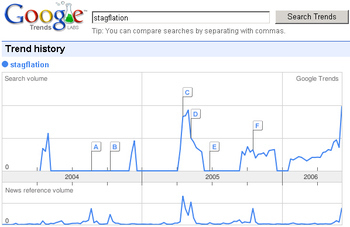 Below is the trend search for "stagflation." There has definitely been a pickup in recent weeks as people seem to be worried about the evil word. 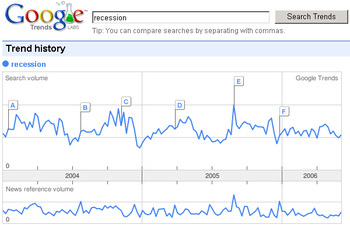 There hasn't, however, been a pickup in searches for "inflation" or "recession" - the two things that essentially make up stagflation. I guess people search for the worst. It's that time of the month again - the first of the month. 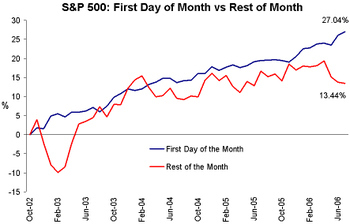 During this bull market, the cumulative return of the S&P 500 on the first trading day of each month is 27.04%. This blows away the cumulative return of the rest of the month which is just 13.44%. 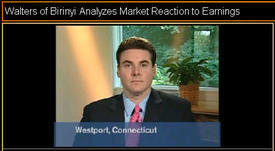 This means that 67% of the gains since the market lows of October 2002 have come on the first trading day of the month. The last two months have been especially profitable, with June 1st going up 2.05% and July 3rd going up 0.79%. This week's poll saw an increase in bearish responses from 37.50% to 45.45%, even though the Dow had its largest one-week gain in two years. 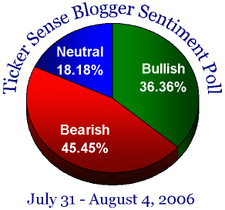 We are starting to see a little more conviction from respondents also as the number of neutrals dropped below 20%. Please see below for links to all of our blogging contributors. And thanks to all who participated! Justin Walters of Ticker Sense made an appearance on Bloomberg TV and Bloomberg Radio this morning discussing second-quarter earnings season and how stocks are performing. We'll try to get a screenshot or a streaming video of the interview to post later and we'll also do a post on some of the topics discussed. While we don't have the video, here is an article from Bloomberg.com that mentions some of what was said in the interview. With the S&P 500 up over 1% today following the weaker than expected GDP report, investors seem to think that while the economy is slowing, it will do so at “Goldilocks” pace. According to one indicator they may be right. 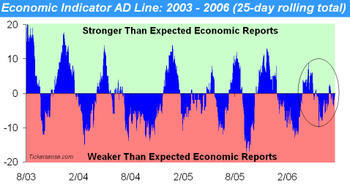 Below we have updated our Economic Indicator A/D line where we tally the number of economic indicators which come in above and below forecasts. Since April, the most recent peaks and valleys of the chart are much smaller than they typically have been in the past. There are two possible explanations for this. The first, which we think is unlikely, is that economists are doing a better job at predicting the economy. The other possibility is that the economy is neither firing on all cylinders (where economic reports consistently beat forecasts), nor is it making a crash landing (economic reports consistently coming in below forecasts). If you’re like us you’ve probably been thinking that there has been a noticeable increase in the number of stocks which have been having significant gaps at the open vs. the prior day’s close. In order to test this theory, we looked back over the last year and counted the number of stocks in the S&P 100 which gapped up or down at the open by at least 2.5%. 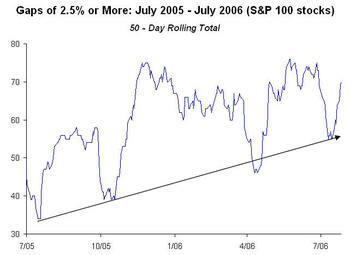 As the chart details, over the last year the trend is clearly up, indicating the return of overnight risk to the current market. 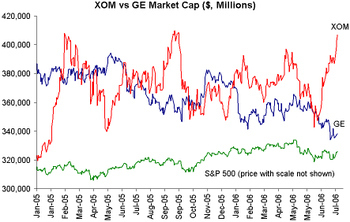 With XOM trading higher on earnings today, we checked in on its status as the world's largest company by market cap. As shown by the chart below, its competition with GE isn't even close at the moment. Exxon currently has a market cap of $405.5 billion, a little over $64 billion more than General Electric, the next closest competitor. 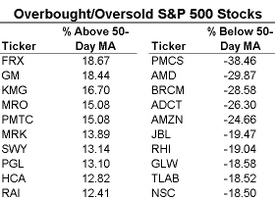 For those looking through names this morning, below are lists of S&P 500 stocks that have been up or down for at least 5 days in a row and the ones furthest above and below their 50-day moving averages. Interestingly, YHOO has been up for 5 consecutive days ever since their earnings disaster last Wednesday. Does AMZN do the same? 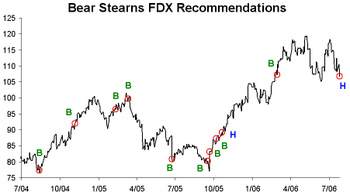 This morning, FedEx (FDX) was downgraded from Buy to Hold at Bear Stearns. As shown by the chart below, their historical calls on the stock have been less than spectacular (what's up with those three buy calls and then a downgrade right before the thing took off last October?). We might want to look elsewhere for advice on this one. 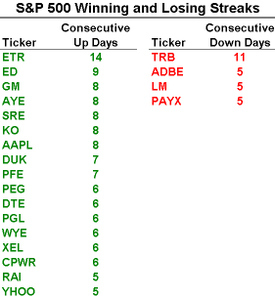 With GM trading up on earnings numbers that were much better than expected, we revisit once again the performance of the Dow 30 members year to date. 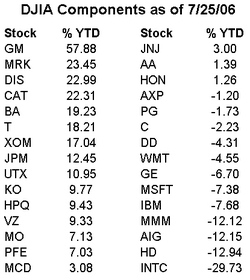 As we have noted before, GM remains the least favored stock among Dow members by equity analysts. It currently has 5 buy ratings, 7 holds, and 6 sells.